Hundreds of “dune bashers” gather in the desert to ride the dunes outside Jeddah, Saudi Arabia, every Friday afternoon. Yesterday my Saudi friend Ra’id Baty came by to pick me up. He said, “Sam, we’re taking you to something really special. 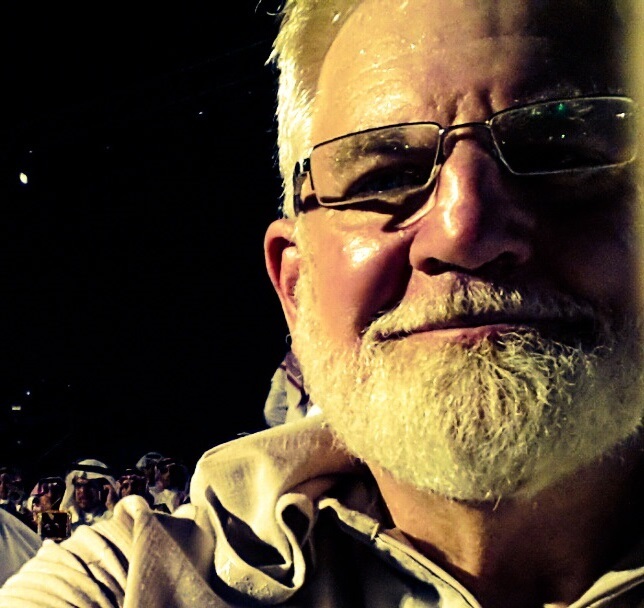 We’re going to a car rally in the desert near Mecca.” I really didn’t know what to expect, but I quickly changed into my Saudi thawb and climbed on board.We headed south from Jeddah in Ra’id’s Toyota 4J Cruiser, eventually turning off the road. As we took off directly into the desert, we flew by several other SUVs and suped-up trucks that had stopped to let some air out of their tires in order to get more traction in the sand. We were roler-coastering up and down over several miles of huge sand dunes. 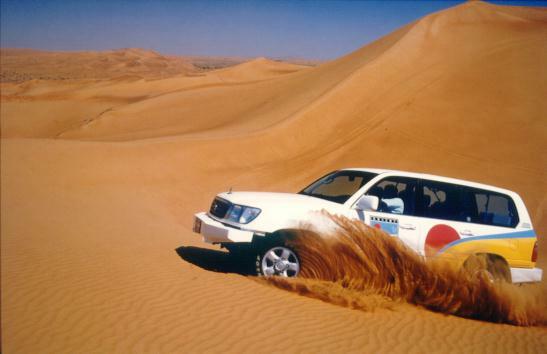 I was told that in other Arab states there are “dune bashing” tours for tourists, but in Saudi Arabia people take to the desert dunes in their own vehicles. Here you drive your own car, or you rent an ATV from some local Bedouins. We continued in Ra’id’s Cruiser until we happened on what must have been a thousand other Saudis who were gathered with their 4×4’s of all makes and models, some modified with thousand-horsepower engines. Weekend “dune bashing” attracts thousands to the desert outside Jeddah, Saudi Arabia. We drove almost straight up one of the more moderate dunes and parked our 4×4 on top. We got out and joined other onlookers in the swirling Saudi desert sands for an amazing two-hour show. 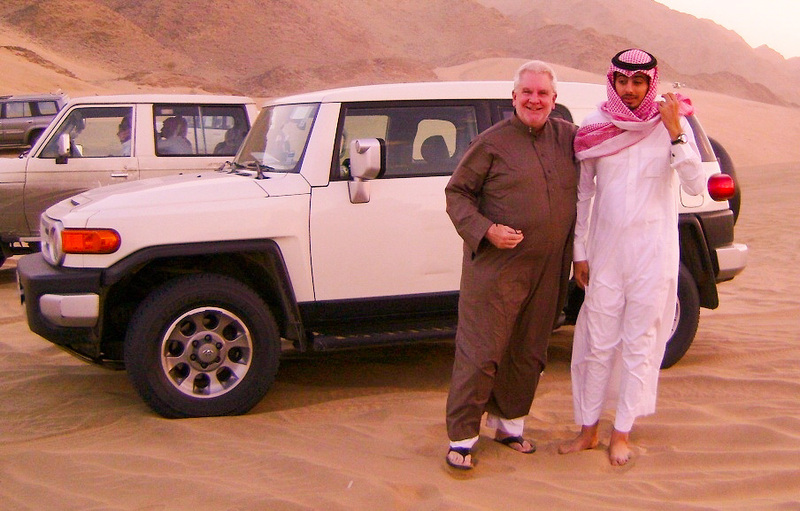 Ra’id said the soft sands can make driving very complicated, and just having a 4×4 vehicle may not prove to be enough for a successful dune bashing outing. He said knowing how to get unstuck in the treacherous sand is just as important as learning how to drive in the desert. I found out that getting stuck will not only be hard on your vehicle, but can also possibly leave you stranded in the sand for hours while you wait for help. If you’re driving alone through the dunes (not recommended! ), many drivers look for camel manure or hoofprints, as these are said to be sure signs of hard and compacted sand. A word to my environmentally conscious friends! For any who might be concerned about the environmental degradation of the desert, I assure you that any disturbances to the dunes are quickly corrected, as the dunes are constantly in motion, being pushed along by the desert winds.